interview with Maj Mikhail Myagkiy are detailed below. targets in either the front or rear hemisphere, day or night, in any weather conditions and while operating in a passive or an active jamming environment and flying at high supersonic speeds. Designated the MiG-31, the type’s final Act of Acceptance was signed in December 1981 and deliveries to PVO units began in 1982. Myagkiy graduated from Armavir VVAKUL PVO (Higher Military Aviation Red Banner Academy of Pilots of the PVO) in 1977. He started his front-line service on the Sukhoi Su-9 “Fishpot”. He then qualified as a 1st Class Pilot on the Mikoyan-Gurevich MiG-23ML ‘Flogger G’, having accumulated approximately 600 hours of total flying time. At that time he held the rank of captain. In 1983, only two regiments flew the MiG-31. The 786th IAP at Pravdinsk (near Gorkiy) was the first of these units, followed by the 174th GvIAP at Monchegorsk (near Murmansk). Before operating the MiG-31, the 174th GvIAP flew the Yakovlev Yak-28P ‘Firebar’. During the transition to the MiG-31, many pilots left the unit — apparently, they did not want to master the new aircraft. The majority of the remaining 174th trainees were weapon systems operators (WSOs). Therefore pilots had to be selected from other regiments because at that time only 1st Class Pilots were being selected to fly the MiG-31. Consequently, the PVO’s 14th Air Army was required to supply one pilot. At that time Captain Myagkiy was acting as a flight commander. Transfer onto the MiG-31 meant a reduction in position, since the air army commander did not release pilots from their permanent duty positions, but allowed transfer to temporary positions. Myagkiy arrived at the 174th GvLkP in October 1983. The regiment had already been flying the MiG-31 for 18 months and had frequently flown missions against the SR-71. Mikhail Myagkiy executed his first mission against the SR-71 from a combat readiness posture on Aug. 21, 1984. According to his recollection, the procedures for a successful intercept were crazy and completely inadequate when considered against the threat posed by the SR-71’s spy flights. The speed and altitude of the American aircraft simply hypnotized everyone. Therefore, each attempted SR-71 interception was considered a top priority, not only for fighter aviation but also for the PVO’s entire 10th Army. The ground vectoring station on Rybachiy Peninsula typically made the first ‘sighting’. Intercepting aircraft then took off from all the airfields in the north where weather permitted. A mistake at any level — by a pilot, the ground personnel, a command post, or a ground vectoring station — brought with it the threat of a military tribunal (court-martial). Each fighter regiment executed an intercept in its own sector. For the 174th GvIAP, this was the sector of the Soviet border from Kharlovka to Cape Svyatoy Nos. For the unit’s MiG-31 crews, 16 minutes elapsed from the moment the alert was sounded to the take-off command being given. Of this time, two minutes were used to put on the VKK-3 (vysotnyy kompensiruyushchiy kostyum, or altitude-compensating suit), two minutes to run 50 to 60m (55 to 66 yards) in the VKK and get strapped into the aircraft, and the remainder of the time to check out the systems, start engines, and taxi. After 16 minutes the fighter would be parked at the end of the runway, with its engines running, fully prepared for take-off. When the SR-71 alert was first given, the technical personnel ran to the aircraft and initially removed its R-60 (AA-8 Aphid’) short-range missiles because they would be disabled at velocities above Mach 1.75 (the standard MiG-31 ordnance load included four R-60s and four long-range R-33s (AA-9 ‘Amos’)). Before the aircraft was launched, its inertial navigation system (INS) had to be activated in minimum time. As soon as the green lights confirming that the INS was aligned came on (after approximately 3 minutes), the engines could be fired up. vectoring station determined what route (out route or return route) the SR-71 was following. Five minutes after take-off, the MiG was already at an altitude of 16000m (52,493ft). The afterburners would still be lit and the crew experiencing significant g. In addition, the MiG-31 had a disconcerting idiosyncrasy – at high supersonic speeds (above Mach 2.35), the control stick moved all the way forward, pushing up against the instrument panel. The pilot had to extend his arm fully, which was very uncomfortable and quickly caused fatigue. MiG-25. The great weight of the MiG-31’s onboard equipment and systems had an effect on its performance compared to the ‘Foxbat’, but its instrumentation was significantly greater and a generation more modem. During an SR-71 intercept, many commonly accepted practices were broken. For example, take-off was executed in a northerly direction, while normal procedure called for a take-off to the south. 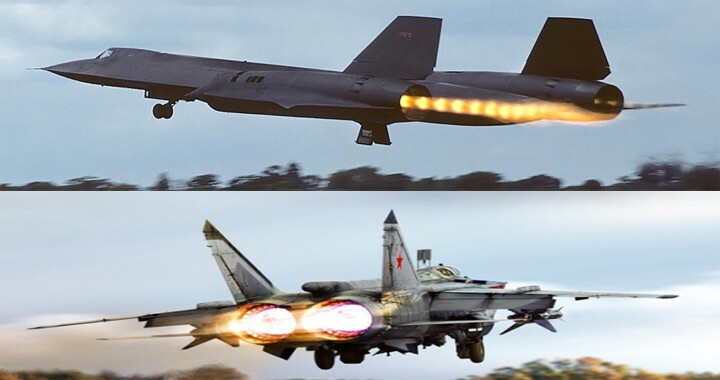 A number of limitations were also removed: for example, the altitude for the transition to supersonic flight was established as 11,000m (36,089ft), but during SR-71 intercepts Soviet aircraft were permitted to pass through the sound barrier at 8,000m (26,247ft). 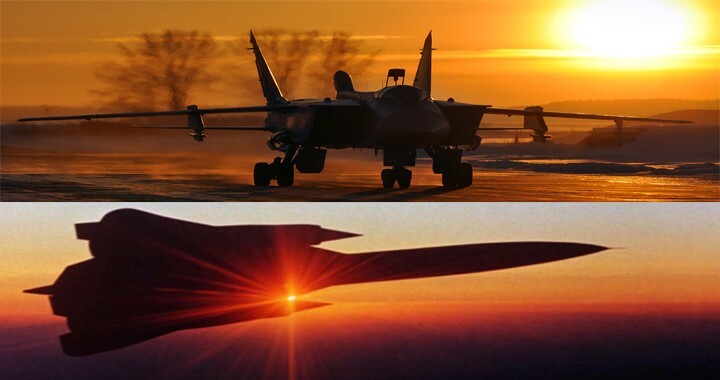 Ground vectoring was usually conducted at an altitude of 16,000m (52,493ft), but during an attack, the MiG-31s reached 18,500-19,500m (60,696-63,976ft) (aiming to establish the best missile launch trajectory, the MiGs gained as much altitude as they could, right up to 20,000m (65,617ft)). Information about the Blackbird normally arrived at the command post when the spy plane was three hours out (this information coming from a radio intercept station). As the SR-71s flew out of Mildenhall, conversations between their crews and those of their supporting tankers were `captured’ during in-flight refueling, so if tankers showed up, the IA-PV0 waited for the SR-71. The standard SR-71 route was normally loop-shaped. If the spyplane appeared from the direction of Norway, it tracked toward the White Sea, farther to the north toward Novaya Zemlya, then turned around on a reverse course to the west over the Arctic Ocean. This track was called a ‘straight loop’. If it initially flew from the direction of the Arctic Ocean toward Novaya Zemlya, then south toward the White Sea, then to the west along the coast of the USSR toward Norway, its track was called the ‘return loop’. The tactics of the intercept were geared toward the type of loop the spy plane was flying. The SR-71 was intercepted using only a thermal channel (infrared, IR). The massive IR emissions of its engines permitted it to be detected at a distance of 100-120km (62-75 miles). The MiG-31’s thermal detection system was called OMB (or optical multifunctional apparatus) and was mounted in the lower nose of the aircraft. The device was lowered and turned on by the WSO. The MiG’s radar was not turned on. On combat alert, the radar was set on a combat frequency, and in order not to expose this frequency to a ‘probable enemy’, the radar was not turned on. A passive system (the thermal apparatus) was adequate for a reliable intercept. After the capture of the target by the OMB, a target indicator showing the range to the target appeared on the sistema edinoy indikatsii (SEI, unified display system) in the pilot’s head-up display (HUD). A voice indicator, using a pleasant female voice (known as ‘Rita to the crews), announced `Attack!’. The range to the target was calculated by the aircraft’s BTsVM (onboard digital computer), using a triangulation method that employed other onboard sensors. This was very good, because, for example, on the MG-25 the pilot did not receive range to target data as it was only passed from ground vectoring stations. Also, the ZDR (or zone of a range of missiles, basically the engagement envelope for che missiles) was projected on the HUD. After the ‘Attack!’ signal, missile preparation began. Targeting instructions were handed off to thegokvka samonavedeniya (GSN, the missile seeker head). 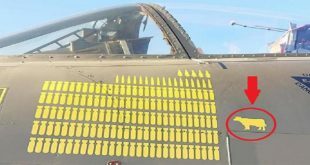 Four green triangles appeared on the image of the MiG in the cockpit display after the missiles had been prepared for launch. The bortovaya radiolokatsionnaya stantsiya (BRLS, onboard radar) was turned on only in the event that the vectoring station issued an order to destroy the target. In this case, the WSO would turn the radar on. Information regarding the target would then be instantly transferred from the OMB to the radar. After this, the pilot had only to push the firing button and the missiles would be launched. If the SR-71 had violated Soviet airspace, a live missile launch would have been carried out. There was practically no chance that the aircraft could avoid an R-33. But in the early 1980s the Blackbirds did not violate the border, although they sometimes ‘tickled’ it (came right up to it). Indeed, local counter-intelligence dreamt of finding pieces of the SR-71, if not on land then in the territorial waters of the USSR. Mikhail Myagkiy particularly remembers his eighth intercept, when he managed to gain visual contact with an SR-71, and not just in the form of a spot on a screen. As a keepsake, he preserved the printout of the recording from the ‘black box’ through which all the intercept data was processed. appearance of an SR-71 was always accompanied by nervousness. Everyone began to talk in frenzied voices, to scurry about, and react to the situation with excessive emotion. “I ran to put on my VKK and GSh-6 [germashlem, flight helmet], and over that a fur-lined flight jacket with IPS [individualnaya podvesnaya systema, parachute harness], and ran the 60m [55 yards] to the aircraft. I was not flying with my own WSO, but with Aleksey Parshin, our flight WSO. When I sat down and was being strapped in (it was simple and convenient to be strapped in wearing a jacket and IPS, which is why we flew in them), the readiness lamps for the INS were lit. I pressed the engine start button, reported to the command post, and immediately received the command to taxi to the runway. We sat on the runway for about five minutes; my WSO ‘read the prayer’ [loudly went through the pre-takeoff checklist]. “After the take-off order from the command post, we lit the afterburners and took off. Our take-off speed was approximately 360km/h [224mph]. Not coming off afterburners, we went for altitude with a 60° right bank and turned to a course of 100°. We attained 8,000m [26,247ft] and reached the horizontal area (for acceleration) in which we passed through the sound barrier. Here vectoring station `Gremikha’ had already assumed responsibility for vectoring us. Our indicated speed at this time was 1,190km/h [739mph]. We went for altitude again, up to 16,000m [52,493ft]. At 16,000m we were flying at Mach 2.3 and made a left turn to a combat course of 360°. The WSO lowered and turned on the OMB and within five seconds had captured the target. A feminine voice in the earphones announced, Attack’, and a symbol was illuminated on the SEI. The SR-71 was proceeding on the ‘return loop’, from east to west, so we began the intercept immediately. “As usual, we executed an ‘aiming run’ from 16,000m, gaining altitude to 18,900m [62,008ft]. After closing to 60km [37 miles] I spotted the contrail of the SR-71 on an intersecting course. I reported the heading to my WSO over the SPU [samoletnoye peregovornoye ustroystvo, intercom], ‘I have visual!’ A contrail at 22,000-23,000m [69,000-72,000ft] is very rare, but on this day the weather was excellent and the air was transparent, and the contrail was clearly visible. I passed under the spyplane: it was 3,000-4,000m [8,843-13,123ft] above us, and even managed to make out its black silhouette. The SR-71 was flying over the ocean ever so carefully on a track 60km [37 miles] out from, and parallel to, the coast. I reported ‘we’re breaking of to the command post and came off afterburners. We had been airborne for 15 minutes 40 seconds. “The Blackbird was flying its normal route, over neutral waters, and it made no sense to follow it. Therefore the vectoring station gave the command to turn onto a course for our airfield. We dropped down to 15,000m [49,212ft], transitioned to horizontal flight, and engaged a stopwatch. This was the so-called ‘area for canopy cooling’. During flight at speeds in excess of Mach 2, the skin, including the canopy, heated up to 800°C. Therefore it was necessary to cool it. Failure to do so might result in cracking or catastrophic failure during subsequent altitude reduction. Our speed remained in the order of Mach 1.6.
straight-in landing at a speed of 310km/h [193mph]. The entire flight had lasted 50 minutes. “During the 15 to 20 minutes when I was on a combat course, the second alert crew was sitting on the ground with engines running. Later they shut down their engines, but the pilot and WSO sat in their aircraft in readiness until our landing. Publishing and is available to order here.